So I was at Donington a few weeks ago for my second trackday, really excited and looking forward to a great day in perfect weather. 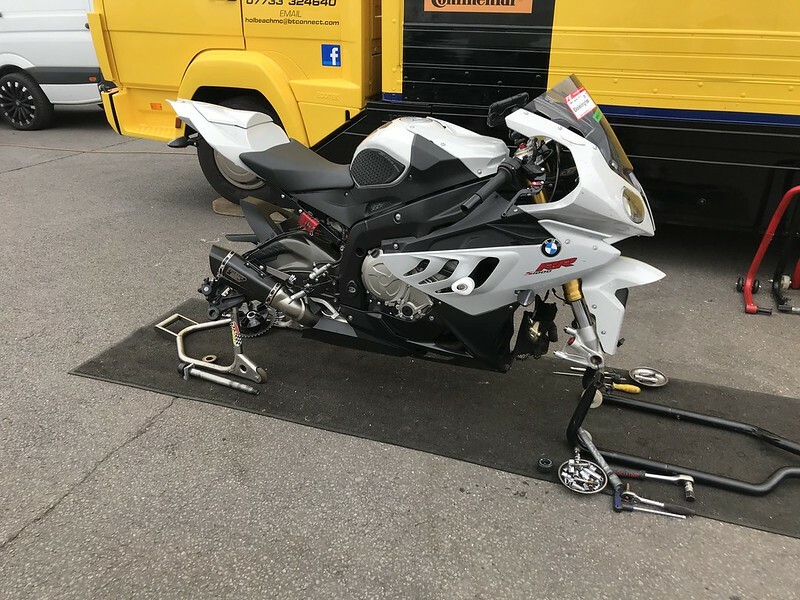 It turned out to be 'crash an S1000RR day' but that wasn't advertised! First session was really good, nice and slow build up and got back into the swing of things pretty well, a lovely Tyco rep hit the gravel at a reasonable speed, guy looked ok luckily. Bike was running well, and despite my rearsets being set too low causing me to catch my toe a few times things were spot on. Picture from the first session below. There was a suspension truck there so decided I'd pay them for some knowledge and set the bike a little more to suit me an my riding, all sorted and ready for the second session to take it easy and see how different it was. Almost at the end of the first lap to get some heat in my tyres, slightly off the racing line coming around Goddards and the front end just washed out from underneath me into a lovely lowside. 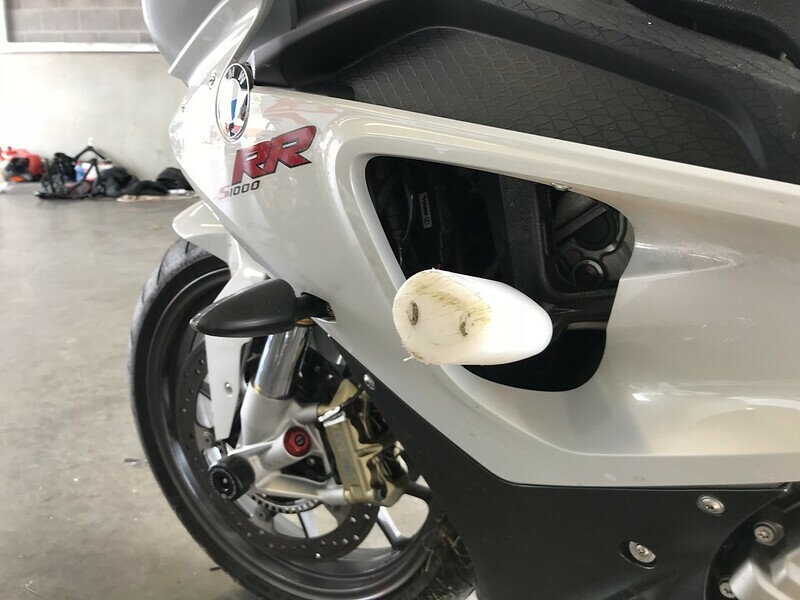 In hindisght I was obviously going too fast for the heat in my tyres but at the time I wouldn't say I was going quickly at all; according to the guy behind me there's a slight bump on the line I took which would have probably unsettled the bike and not helped. 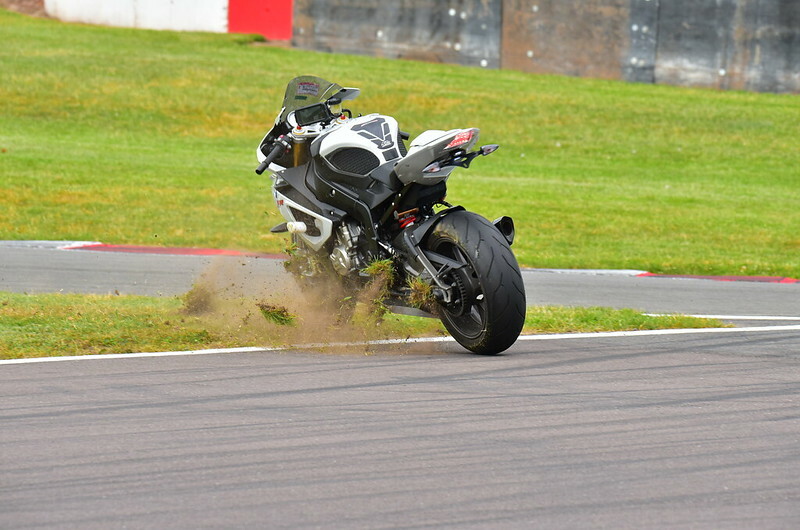 I think the tyres were a little high as well, so dropped a few PSI and it seemed better when I was back out. Went down, bike slid away from me luckily and I had a nice roll about after it and very lucky to not even hit my helmet on the floor! Leathers held up really well but were due to be replaced so I've bought a 1 piece RST set now which is a bit better for the track anyway. The crash bungs have certainly saved me a written off bike and paid for themselves! Got it checked over by the suspension guy and tyre guy at the track, all clear and safe after re-fitting the tyres just incase. I jumped in the van and nailed it home to get my box of spares (that should have been in the van! ), got back and fitted the standard rear sets, quick trip round the car park to make sure everything was ok braking / gear wise and managed to get out for the last 2 sessions of the day, so not all lost. Tyre wear looked ok to me, but be good to get some advice if they 'look' like they should?! 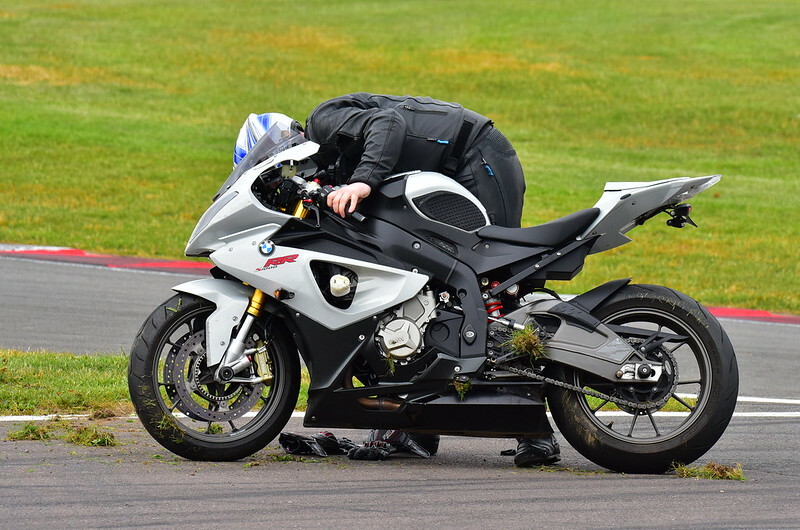 Whilst I was tinkering I think there was another 3 S1000RR's that came off, one looked fairly bad. Rider was up and about but looked very uncomfortable. So many lessons learnt but luckily not too expensively. Got another day at Donington on 23rd then Rockingham on 28th, can't wait. Goddards is a tricky corner, don't like it myself and many have crashed there. 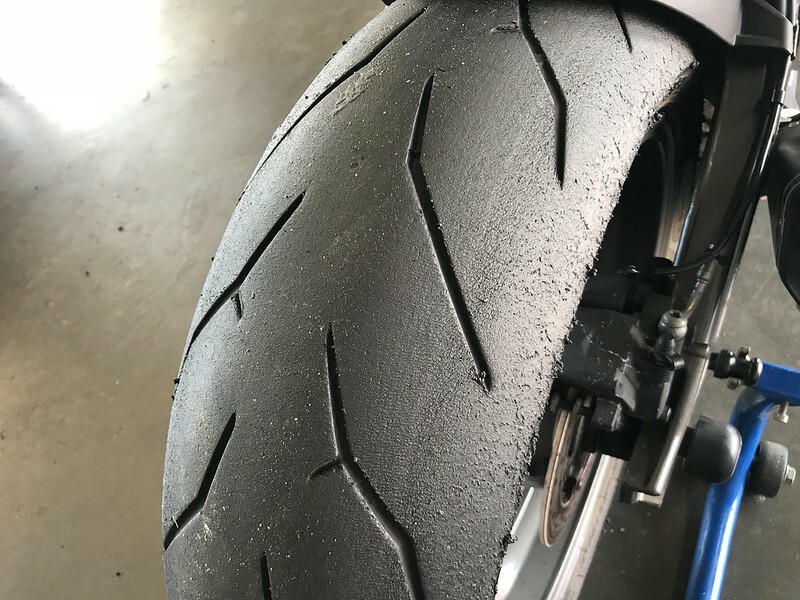 Tyres look fine to me, what pressures were you running? 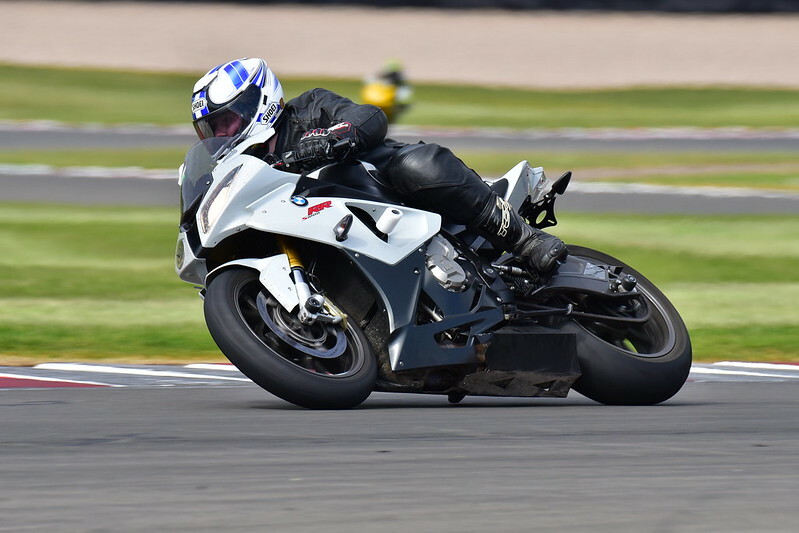 I've never ridden Rockingham but as its now my local track I'm intending to have a blat round it whenever I get some spare time. Last edited by MacRR; 9th July 2018 at 08:47 PM. I'm glad no injuries and no serious damage to the bike! it's kinda okay, but I believe you can see a cold tear building up on the side. What pressure did you run in the 1st session ? What are your rear shock preload/comp/rebound set to ? 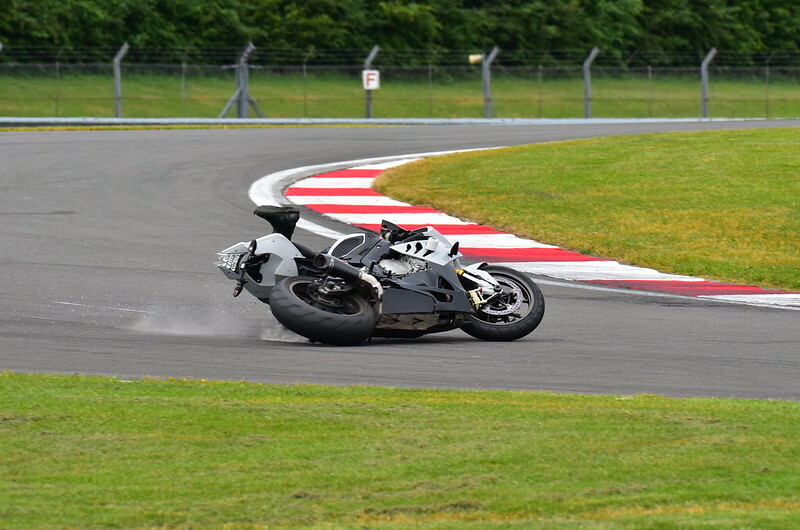 although, obviously it didnt contribute to the crash at all, as it was a left-hander. Last edited by bmwbadboy; 9th July 2018 at 08:57 PM. Tyres look absolutely fine, although I would expect more marbling on a hot day so perhaps a smidge too much pressure. Goddards is one of the trickiest lefties on any race circuit, off camber, bumps, difficult line to get spot on. I suspect a combination of new suspension settings, slightly high pressures and catching a bump whilst on lean to get back on line have caused the low side. But if I really knew what I was talking about I’d be running in motogp. At least you are good to go next time! Mac - Rockingham is very abrasive, the oval part of the circuit takes some nerve, other than that its a breeze . Thanks for the kind words, was expecting a bit more piss taking to be honest! I ended up running 30F 28R when I went back out, before that I was about 32F 31R. I wasn't pushing as hard as I maybe would have in the last 2 sessions, few nerves after coming off so I just wanted to get straight back out and enjoy myself rather than being worried for weeks until my next outing. Rear shock I 'think' was set to 7 & 7 by the suspension guy, it did feel a lot more composed under braking and coming out of the corners, but again I was a bit cautious, still got a lot to learn! 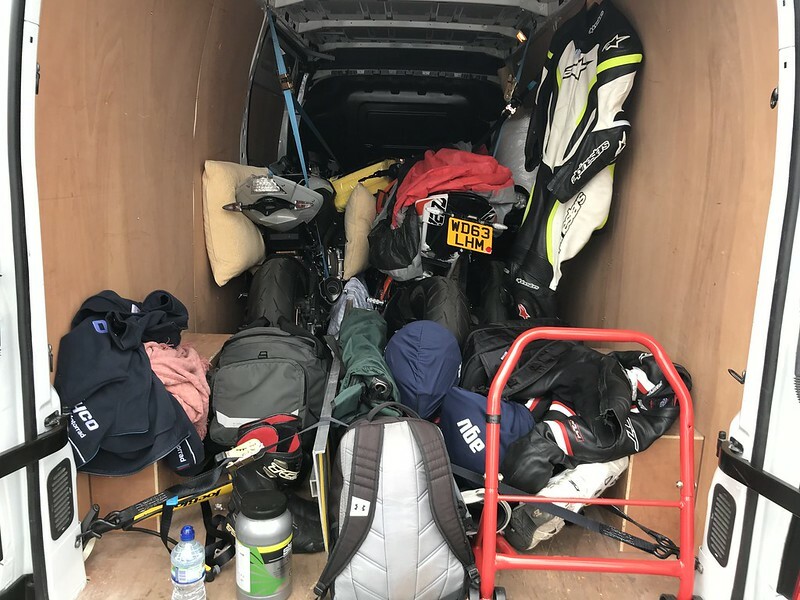 I wouldn;t go as far to say I enjoyed it but having never crashed a road bike it did give me some good experience as to what to expect, I dare say if I knew what I was doing I could have saved it as it seemed to take an age before it went completely but I probably stayed pretty rigid trying to hold my poo in! So, 31R in 2nd session, without the warmers ? If so, yes, it's quite high, 28R or 27R cold is about right. I would also check chain tension, from the pic above it does look a bit tight. Last edited by bmwbadboy; 9th July 2018 at 10:21 PM. 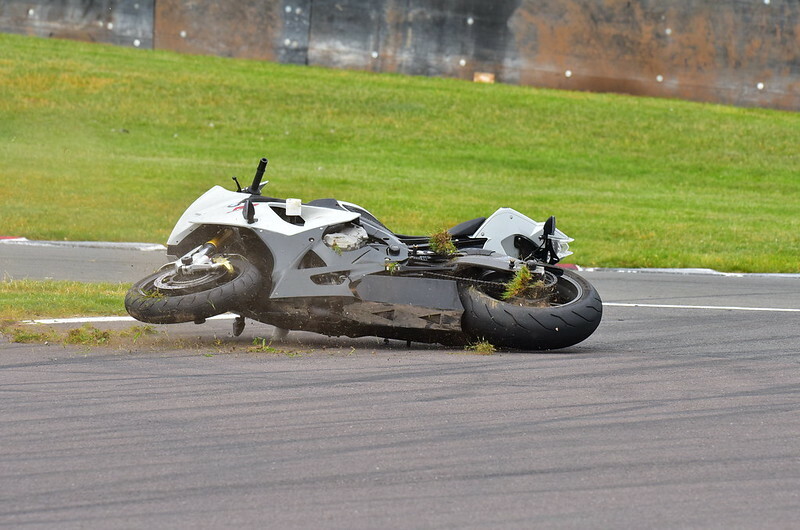 You are not the first person to crash at Goddards and you certainly won't be the last! It's one of the more difficult corners to get right at Donington Park. Side note: It's not your rearsets causing you to catch your toe...it's your foot position on them. 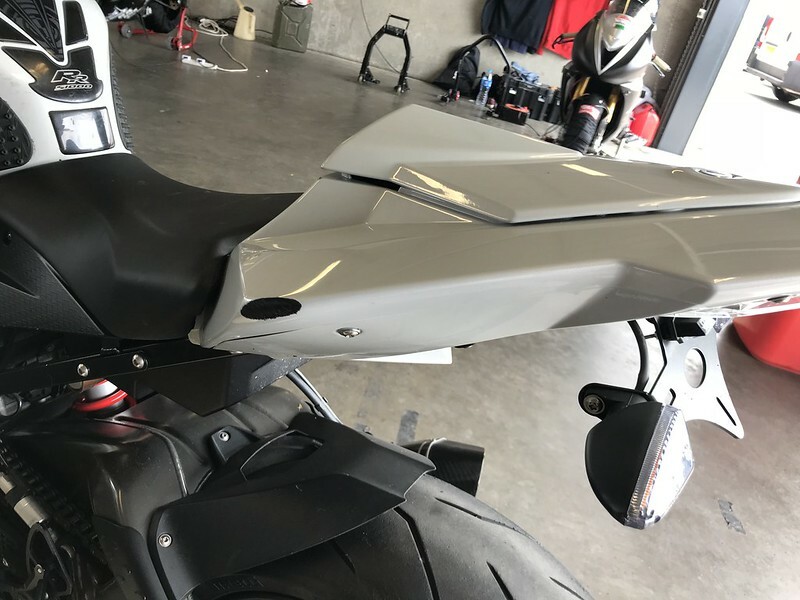 Judging from picture 1 where I can see your toe under the bike, your inside foot, in a turn needs to move back on the peg more. It's bang on 30mm slack, I check it all the time as quite paranoid about it being too loose / tight. I know my foot positioning isn't quite right, however I had them set to the lowest possible point and I think that isn't helping me getting my feet right to be honest. at a guess I'd say they're 50mm lower than standard, must make a difference? I think I was probably gripping too much and froze when it started slipping. I'm pretty sure I wasn't on the throttle as I was still a little away from the exit. Although I'm not too sure either way, as you say plenty to learn! Thanks for the good post. Am glad to hear you were not injured in the crash and that your RR has not been too greatly damaged.